During the 2016-2017 fiscal year, ITS Enterprise Applications’ ConnectCarolina team shifted its focus from stabilizing the HR, payroll and finance components to delivering new features. Some of Enterprise Applications’ accomplishments include rolling out Slate to additional schools and programs, launching the Salary Funding Report and upgrading the Time Information Management System (TIM), UNC-Chapel Hill’s official timekeeping system. In the post below, please read more about Enterprise Applications highlights from this past fiscal year. University representatives participate in Enterprise Applications’ user acceptance testing for the Commitment Control Redesign project. 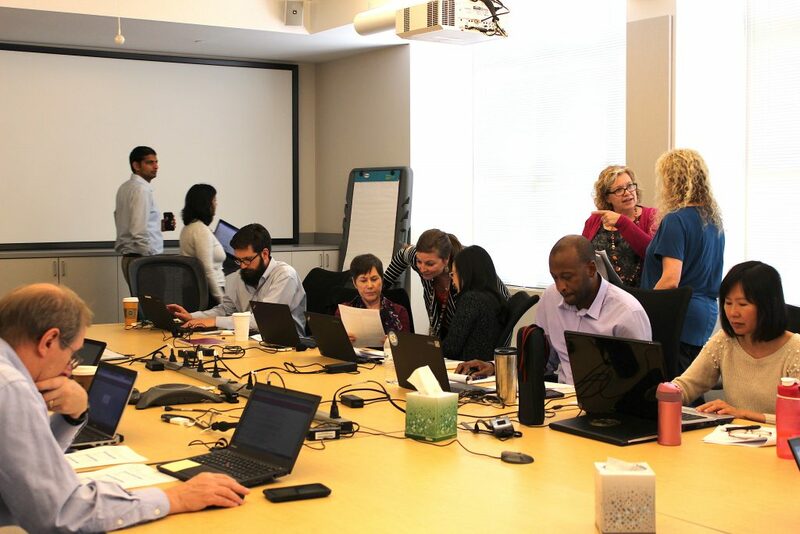 The ConnectCarolina team shifted its focus in fiscal 2016-2017 from stabilizing the HR, payroll and finance components to delivering new features that campus users of ConnectCarolina and InfoPorte have been requesting. Campus received several new reports, among them payroll and salary funding reports and new monthly financial reports that provide a static snapshot of the previous month’s transactions and budget balances. Generated each month when Accounting Services announces that the previous month is officially closed, the reports make it easier for campus finance staff to reconcile their State, F&A and Trust funds. Improvements resulted in more accurate projected amounts for salary and fringe in InfoPorte, which means report budget balances are more accurate, especially for contract and grant funds. In addition, the reports on the previous day’s transactions are now available earlier in the day, usually before 8 a.m.
A number of other long-awaited features made ConnectCarolina more usable and useful for campus users. It is now possible to enter multiple lines on a journal instead of creating a separate journal for each line. It became easier for campus financial staff to categorize their purchases correctly when the list of category codes was reduced from 55,000 to around 850, which in turn means the University has better information for negotiating prices with vendors. System tuning improved system performance. During the 2015-2016 fiscal year, the University began using Slate as an admissions application and customer relationship management (CRM) platform for Undergraduate Admissions. Slate manages online applications for admission to the University, facilitates the reading and review of applications, and organizes admissions-related events for UNC-Chapel Hill. During the 2016-2017 fiscal year, Enterprise Applications rolled out the Slate platform to these additional schools and programs: Graduate School, School of Nursing, Eshelman School of Pharmacy, School of Medicine, School of Dentistry, School of Law, Gillings School of Global Public Health, School of Government, Kenan Flagler Business School, School of Media & Journalism, School of Education, BRIDGES, Dental Assisting Program, Allied Health programs, Friday Central Continuing Education and intra-transfers of undergraduates to professional schools. During the 2016-2017 academic year 25,502 applications were processed through Slate. Rolled out in February 2017, the new Salary Funding Report provides a single place to go to see how employees’ salaries are funded and the amount of salary budgeted to each source. Before this report, Finance and HR staff were creative about how they found this information, for example, by creating ePAR forms to see an employee’s funding sources or using the Payroll Accounting Adjustment Tool (PAAT) to correct funding immediately after payroll was processed. Staff members can now run a detailed report on a large number of employees before the payroll deadline, using a variety of search options to narrow the information to exactly what they need. With this report, managers have a tool that makes it easier to make funding-related decisions, like those related to the Annual Raise Process or specific grants or departments. Learn more about the report. The Time Information Management System (TIM), UNC-Chapel Hill’s official timekeeping system, was upgraded in November 2016 to the benefit of the 19,000 employees and managers who access it from the self-service section of ConnectCarolina. TIM is used to track hours worked and leave taken for SHRA and EHRA permanent employees. The upgraded version works smoothly with all browsers because it does not include Java. It requires fewer clicks and displays the most important information on the main screen. Employees can now see timecard totals and accrual balances in the same place that they enter time or pay codes, such as vacation. Managers find that editing timecards and viewing employee information is more intuitive and appreciate the alerts highlighting timecards that are missing information and need to be updated.